Europe with a single currency sounds dandy. No more vacation hours spent paying unpredictable commission charges in bureaucratic European banks, no more coming home with pockets full of Monopoly-money notes. What could be simpler and saner than a single currency, legal tender from London to Lisbon? They’re working on it. Since December 1989 an intergovernmental commission has been laboring over the details of what Eurocrats call Stage 2 of Economic and Monetary Union, or EMU. This could mean the creation of a Central European Bank as early as 1994, with a single currency by the end of the decade. Polls show that 64 percent of EC citizens accept the idea. In May even the once reluctant British appeared to bow to the inevitable, dropping their alternative scheme for a parallel (rather than single) European currency. But despite the consensus there remain, as the British chancellor recently put it, “a million questions.” Or, to be exact, two: Will it work? And is it really necessary? Economics and history suggest the answer to both is no. The dream of a single bill of exchange across Europe goes back some way. There were moves toward harmonizing the main European currencies soon after the Bretton Woods exchange rate system broke down in 1971, with the creation of a voluntary agreement to keep currencies in line with each other—the so-called snake. In 1978 France and Germany went one step further: they set up (in classic Eurospeak) a system of “fixed but flexible exchange rates,” otherwise known as the European Monetary System. The current system, which developed out of the EMS, is best explained by an image. Picture seven climbers, representing seven Eurocurrencies, climbing Mont Blanc. They’re tied together by ropes, representing agreements to keep their exchange rates within a narrow range of one another—plus or minus 2.25 percent of agreed parities. Two newcomers, the Spanish peseta and the British pound, are attached to the rest by elastic bands: their range is a wider 6 percent in either direction. And two more stragglers, the Greek drachma and the Portuguese escudo, remain unattached. At present the lengths of rope and elastic—i.e., the exchange rate parities—can still be adjusted if someone is straining at the leash or dragging his feet. But adjustments are increasingly frowned upon; and by January 1994, according to the new plan, the ropes and bands will have become chains linking the climbers together so inflexibly that it will no longer make sense for them to exert themselves as individuals. Instead they’ll pool their resources and build a ski-lift: a European central bank. The pound, deutschmark, franc, lira, peseta, guilder, crown, punt, drachma, and escudo all will linger on for a time with their eccentric denominations and colorful representations of obscure historical personages. But they will be mere passengers on the lift. Their issue will be regulated not by national banks of issue but by the new central bank (possibly called the “Eurofed,” after the one in the United States), which will treat them as mere regional varieties of the new European currency (probably called the ECU, short for European Currency Unit, which already exists as a unit of account). It will be much like the present situation in Scotland, where the Scottish banks can still print their own picturesque notes, but only as substitutes for existing Bank of England currency. IN ESSENCE, there are three arguments for the move. The first is that it will reduce the costs of trade between the EC countries, as European traders and investors no longer have to convert from one currency to another. The second is that monetary unity will lower inflation in other EC countries to the low levels achieved by West Germany. The third argument for EMU is that it will help accelerate EC political union. Americans have reason to be sympathetic to all these aims. What, after all, could possibly be wrong with a stabler foreign exchange market, lower inflation, and greater political integration in Western Europe, with American-style institutions replacing the quarrelsome nation-states of old? Well, take the arguments one at a time. The first, trade-stimulating theory, sounds plausible, but it’s hard to put a figure on what would be saved by ending currency transactions, and harder still to guess how much more trade would be generated, since intra-EC trade is already enormous and the removal of all internal trade barriers by next year will make it bigger still. From the point of view of business, a Eurocurrency ends the uncertainty of predicting currency movements, but it also removes all those opportunities for playing the market, and reduces the range of currencies (and interest rates) that companies can choose for their short- or long-term assets and liabilities. The second argument—the anti-inflation theory—is trickier. Imposing low inflation through fixed exchange rates or currency union can exact a heavy toll. The pre-1914 gold standard—in reality a sterling standard that hinged on Britain’s role as a huge capital exporter and importer of foreign goods—produced a legendary recession, provoking protests like the American populist William Jennings Bryan’s cry that the common people were being “crucified on a cross of gold.” (The gold standard didn’t even deliver price stability. From the mid-1870s to the mid-1890s prices fell, only to rise thereafter.) Sharper pangs were caused by the attempts after the First World War to restore fixed exchange rates based on the gold standard—notably in Britain, where Churchill tried to return sterling to its pre-war rate against the dollar, generating mass unemployment and civil unrest. The contemporary parallel is with Spain, which now pays for EMS membership with interest rates of more than 16 percent and unemployment of 15 percent. Full-fledged currency unions can be as grueling as fixed exchange rate schemes. Take eastern Germany, where the incorporation of the German Democratic Republic into the West German monetary system since July 1990 has been, in the words of the former Bundesbank President Karl-Otto Pöhl last month, “a disaster.” GNP fell 15 percent—and is still falling—in the east in 1990; unemployment there could rise as high as 40 percent by the end of this year. The problem is that removing exchange rate flexibility removes a relatively painless form of adjustment between regional and national economies. Differentials in competitiveness can no longer be softened by exchange rate shifts. As happened in Germany, firms in the weaker economy simply cannot compete in the same monetary system. To attract labor they have to match western wages; but their productivity levels are too low to produce competitively priced goods. The only options are liquidation or massive investment. The IMF’s latest figures suggest that as much as 170 billion deutschmarks would have to be invested every year for the next ten years to put east German industry back in the running. Until recently it was an article of Euro-faith that the EMS had a secure anchor, the deutschmark, and that the ECU would inherit its stability. But that assumption can no longer be sustained. The strain of unification is bringing an end to West Germany’s era of parsimonious productivity. Even with new taxes totaling DM40 billion, the German deficit for this year is still likely to top DM150 billion. At more than 4 percent of GNP, that out-Reagans Reagan. Suddenly the markets have cottoned onto the problem. News of collapse in the East, the disappearance of West Germany’s trade surplus, wage pressure in the West, the assassination of the man in charge of East German privatization, election setbacks for Chancellor Kohl, and most recently the resignation of Pöhl—all this has finally undermined confidence in the deutschmark. The anchor shows signs of slipping. So much for the economic arguments. But will a move to a single currency help political integration? Not necessarily. There’s no inherent connection between monetary and political union, especially where federal states like the projected United States of Europe are concerned. The United States of America thrived in the nineteenth century with a monetary system that verged on the anarchic; so great were suspicions of central banks that the Federal Reserve system did not come into being until 1913. The federal German Reich developed a national currency only after it had been politically unified by Bismarck’s victories over Austria and France. Even then its monetary policy was controlled by the gold standard (a monetary system that certainly didn’t promote political convergence). When that control was removed in 1914, the German currency self-destructed within ten years. The truth about a system as rigid and centralized as a monetary union is that it presupposes a very high degree of political integration. If it’s to work, two things are necessary: a central authority to control federal taxing and spending; and a common political culture to help the less developed regions endure their painful adjustment. Neither of these now exists in the EC. The community’s ability to tax and spend is still tiny (its budget is a fifth of Britain’s alone), and there is enormous disagreement over member states’ fiscal discipline. The common political culture is still decades away. Already reality is beginning to break through the rhetoric. 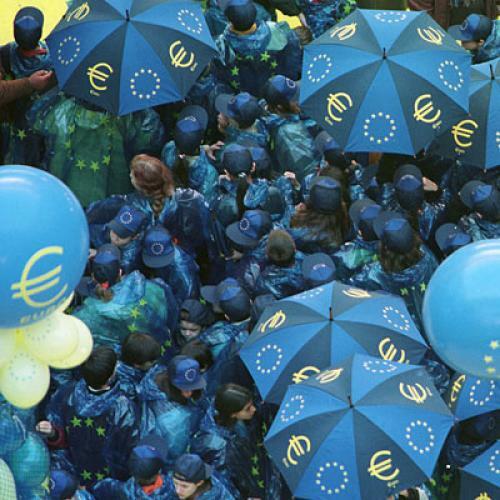 The Germans, beset by their own problems, want to postpone the creation of Eurofed until 1997. The British, worried about coming elections, want to agree to the principle without committing themselves to the practice. The Mediterranean countries are nervous about the thought of fiscal retrenchment. Meanwhile, the Scandinavian and Eastern European countries are demanding membership in the existing EMU-less EC. The truth is that the economic advantages of EMU—compared with what would be gained by simply expanding the existing EC free trade area—are minimal, and the political problems are likely to prove insuperable. The Monopoly money is likely to be around for some time yet. Niall Ferguson is a fellow of Peterhouse, Cambridge. This article appeared in the July 1, 1991, issue of the magazine.